Automobiles are a major contributor to pervasive urban air quality problems. Partly to reduce these air quality problems, China has invested heavily in urban subway systems. This paper provides the first comprehensive estimates of the effects of these investments on urban air quality. The analysis uses a unique data set that combines hourly air quality data, daily meteorological data, and characteristics of cities for all major subway projects between 2013 and 2014 in China. 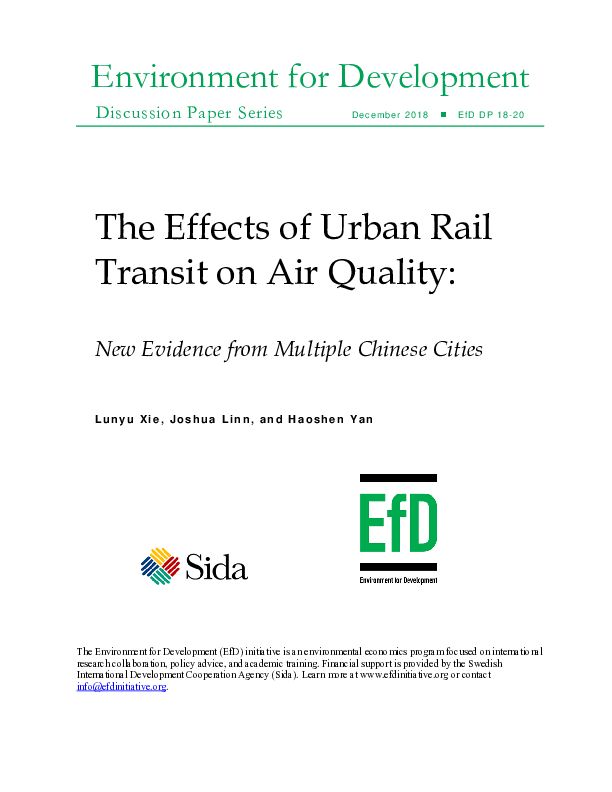 Based on a Discontinuity Based Ordinary Least Squares (DB-OLS) model, we find that a subway project reduced air pollution by 14% on average; it alleviated more pollution in the daytime, especially during non-rush hours; the effects are smaller in the cities with higher income and lower population density; and, the more existing subway stations, the weaker the effect of opening an additional subway line on air quality.